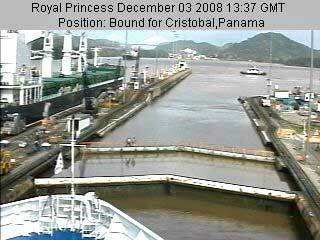 MS Royal Princess is an R class cruise ship owned and operated by Princess Cruises. 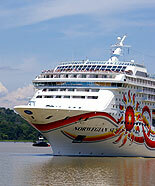 She was built in 2001 by Chantiers de l'Atlantique, St. Nazaire, France for Renaissance Cruises as MS R Eight. Between 2003 and 2007 she sailed for Swan Hellenic as MS Minerva II, before being transferred to Princess Cruises. 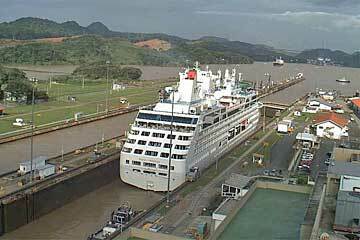 The Royal Princess is seen here doing a Panama Canal transit entering the Canal from the Pacific side from Panama City, in the Miraflores Locks system, heading for the Pedro Miguel Locks. Some of the Royal Princess Destinations are: South America, the Caribbean, the Panama Canal, Europe as well as World Cruises visiting more than 40 of the world’s most exciting destinations. 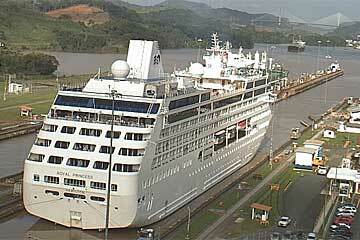 View from the Royal Cruise Ship, see the Live Bridge Webcam here. The new Royal Princess® is a gem of a ship, providing a wonderful and intimate ambience for visiting the world's fascinating destinations. Onboard, you'll delight in many of the trademark features you've come to know on other Princess cruise ships - ScholarShip@Sea® courses, fresh-water swimming pools, a casino, exciting nightspots and production shows.